What a wasted day. It started raining an hour after I left Fremont, and didn't stop until I'd reached Chicago. Fortunately, I didn't have much to see today anyhow, and the rain encouraged me to drive a little further than previously planned, into Indiana rather than stopping an hour further west. 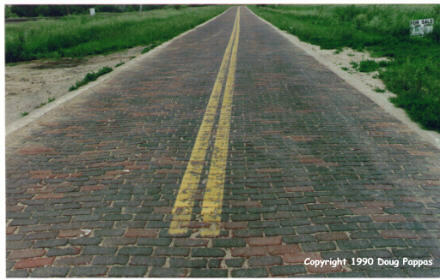 The morning began with a side trip to Elkhorn, Nebraska, where Miles 1437-38 of the original Lincoln Highway have been preserved just as they were when originally paved (with brick) in 1920. After wasting 20 minutes looking for the right road, I drove back and forth a few times. In addition to the annoyance caused by the brick pavement, the lanes were at least two feet narrower than anything I'm used to driving now, even including the 1920s-era New York parkways. A transcontinental journey on this would have been a hair-raising experience. That ended the excitement for the day. The only other significant option would have been a 15-mile detour to Ronald Reagan's birthplace or boyhood home, but I reached Illinois too late in the day for either. So instead I chugged on, across Iowa and Illinois all the way to northwestern Indiana. The character of the roadside changed as well. 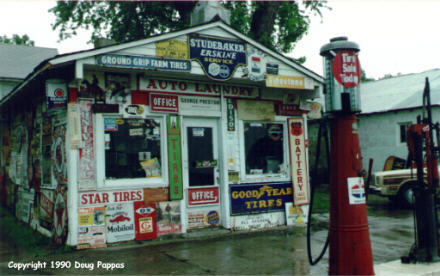 In Iowa, US 30 ran through mile after mile of farmland, and had been re-routed to pass the main section of most towns. In some areas it was even a four-lane divided highway. In Illinois, by contrast, the road bisected all major communities. By the time I reached Plainfield, US 30 -- known almost everywhere in Illinois as the Lincoln Highway or the Lincolnway -- was passing through miles of commercial strips. And when I stopped for the night in Merrillville, ten miles over the Indiana border at the intersection with I-65, the road was a two-mile-long strip of malls, restaurants, motels, gas stations, etc.